This week, our litany of love for all things picklish leaps towards chutney, that harmonious sweet & savoy condiment popularized across the pond. Sweet Deliverance NYC and Saxelby Cheesemongers have teamed up yet again to bring you a never before seen cheese & chutney match made in heaven… Order one for someone you love and spice up their fridge, or come on down to the New Amsterdam Market this Sunday for one of our famous Ploughman’s Sandwiches! 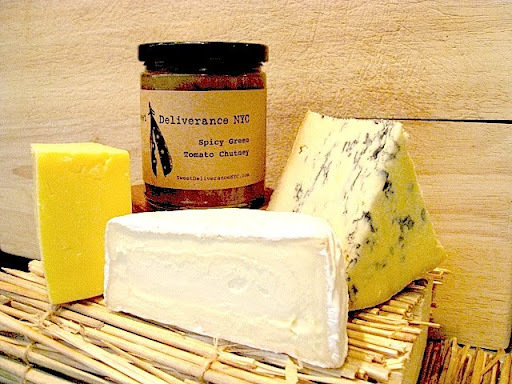 At Saxelby Cheesemongers, we love our cheese & chutney. In honor of fall, and all the delicious apples spilling forth from farmers’ market stalls, we got in cahoots with Sweet Deliverance NYC to cook up an exclusive batch of Raisin Haters Apple Chili Chutney. One scoop of this fruity, fermenty delight atop a wedge of thick and creamy cheese, and you’ve got yourself a new addiction. We chose a trio of fantastic farmy cheeses to complement this spicy, sweet & savory chutney: Noble Road, a truffle-y buttercream bomb of gooey goodness from Calkins Creamery, Landaff, a tart and earthy cows’ milk cheese from Landaff Creamery, and Square Cheese, a quadrangular, junipery, malty, caramelized goats’ milk cheese from Twig Farm. If you’re already hooked (or looking for trouble! ), our first official meeting of C&CA (Cheese & Chutney Anonymous) will be held this Sunday, October 31st at the New Amsterdam Market. That’s right folks… Ploughman’s Sandwiches are back! We’ll be slathering ‘Raisin Haters’ chutney on Sullivan Street bread and laying down a cheesy foundation of Landaff for the munching. Don’t miss out on this singularly autumnal treat! ‘Till next week, eat your cheese & chutney!